Grande salle de bains familiale avec baignoire, robinet mitigeur et douche, bidet, toilettes et lavabo. Salle d'eau avec toilettes et lavabo en bas. Toilettes séparées avec lavabo au fond du hall. Dans la longère, derrière la maison : grande cuisine/salle à manger équipées : cuisinière, micro-onde, lave-vaisselle, réfrigérateur ; réfrigérateur-congélateur. Grande salle à manger pour 12 convives dans le confort. Pour une véritable réunion familiale. Maison Maitre est une grande propriété avec des chambres spacieuses. Bien qu'elle soit prévue pour 11 personnes, elle peut accueillir plus. Selon demande, un accord préalable doit être conclu. Sa capacité idéale est pour 8 jusqu'à 11 personnes. Il est très rare de pouvoir louer une maison traditionnelle sur son propre terrain. Very comfortable property with great facilities from the very private pool garden to the home from home kitchen. Lots of options for al fresco dining and close to a wide range of attractions including the beautiful Côte Sauvage. The house is full of charm and personality on the outside as well as the inside. We were a group of 8 adults with different approaches to what we want to do during vacations. This property covered the majority of the wishes by offering activitities on the property and in the surroundings by means of a lot of cycling and hiking options. It has the charm of being situated in a quiet surronding but close to towns. We enjoyed the local bistro (good food and very nice people) as well as the local bakery. If one room should be mentioned partuculary, it has to be the roomy kichen with its nice/cosy atmosphere, when not beeing out we were always sitting around the the great big table enjoying good 'local' wine to our meals (thanks Geoff). All of us enjoyed the stay and wants to come back. Many thanks to Judith and Geoff for renting to us and for help and recomandations. Best regards, Inger Johanne, Grete Lill, Ellen, Trine, Svein, Arve, Andrev and Per Kristian. Thank you! We are pleased that the property suited the needs of everyone in your party and that you enjoyed your time here. We look forward to welcoming you again. Deze geheel in stijl ingerichte woning is geschikt voor bijvoorbeeld twee gezinnen en is van alle gemakken voorzien. Grote woonkeuken met talloze kookboeken. Heerlijke slaapkamers met met een leuke inrichting en luiken voor de ramen waardoor het koel blijft. Buitenruimte met zwembad en voldoende bedjes en parasols. Patio die zo groot is dat je kunt badmintonnen, jeu de boulen etc. Ook een grote eettafel buiten waar je lang kunt natafelen want de buren hebben geen last van je. Verder beschikt het huis over een tafelttennistafel en voetbaltafel. De eigenaren zijn heel behulpzaam en hebben ons goed geholpen met onze vragen. Thank you Tanja. We are pleased that the house and it’s ammenities appealed to everyone in your party. Beautiful house and gardens with pool in peaceful setting. We have just spent two weeks here with our daughter and family. We loved the house which is spotlessly clean and well stocked. The pool in the gated walled garden was a highlight for our grandaughters aged 4 and 7. The owners, Judith and Geoff are extremely pleasant and helpful. 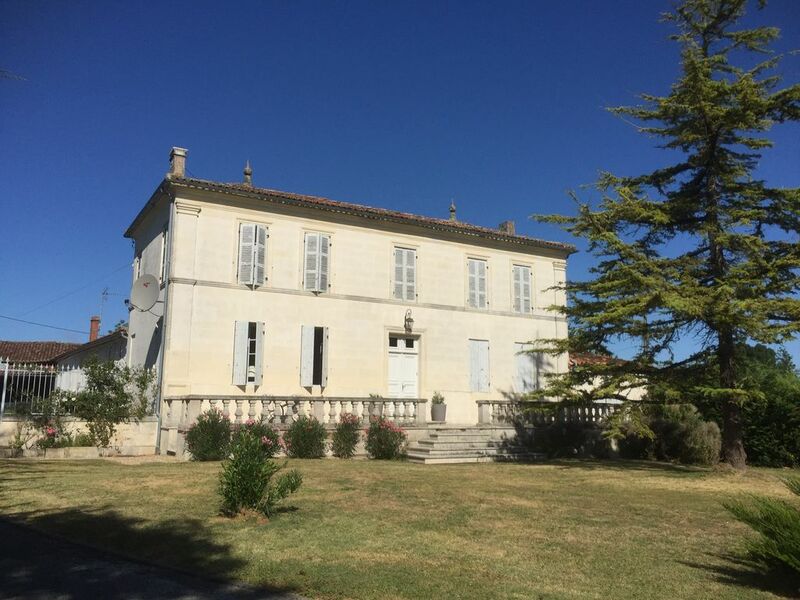 We would recommend this property to anybody looking for very spacious accommodation in peaceful surroundings, about an hour and 20 minutes from Bordeaux airport. Thank you Ian and Sue. We are so pleased to know you enjoyed your holiday at Old Cognac Distillery. We hope we will see you again with your family and friends. A large well equipped property in a quiet rural setting. We particularly enjoyed the space. It was very very hot when we stayed here but you could get away from the worst of the heat in the spacious rooms. Although the road runs by the house it did not bother us as there is very little traffic. Lovely rural area, nice boulangerie, good local restaurant, near Cognac and Pons. Very good hosts who were very helpful but not intrusive. Geoff has a great knowledge of wine and can supply. We had a very good bottle of Champagne at reasonable cost. Nice large warm swimming pool and lovely area and Judith has some lovely plants all around. We thoroughly recommend. Thank you Richard and Elizabeth. We’re pleased that you had a restful and comfortable holiday in our property. Again we had a most enjoyable three weeks in this beautiful house, it is just as you see on the web. You drive up to a house in its own grounds at the edge of a small village. the situation is ideal, very quiet yet only a fifteen minuite leasurely walk or five in the car, the village has all you need including a restaurant and a general store with an artisan butcher, should more be required it is only a short drive to Pons or Cognac. The interior of the house is decorated in keeping with the house, beautifully done but with all modern requirements. the kitchen has been beautifully upgraded from last year,it was beautiful last year!! The kitchen area opens on to an very large enclosed courtyard, along one side of which is a preau with a large dining table its own fridge, a table tennis table, a french football game and a barbecue, perfect for outdoor meals no matter the weather. it is also ideal for a game of boules which are provided. Beyond the courtyard is the walled garden with the swimmimg pool, again enclosed and secure. the pool is heated and in the corner is a lovely covered area with its own table and chairs, ideal for an aperitif while you watch the swallows as they bathe and drink on the air from the pool. The hosts Geoff and Judith are delightful and very knowledgeable about the area and restaurants. they are extremely discrete and only there when you need advice. We have rented houses for forty years in this area of France and this is in our opinion the best of them all. They say that actions speak louder than words, we discovered the Maison two years ago and would we return again, we have already booked! Oh and dont forget to ask Geoff about wine, he is extremely knowledgable and happy to pass on his knowledge and do a wine tasting. Thank you Andrew and Patricia for a thoughtful and insightful review. We very much enjoyed welcoming you for the second time this year and are already looking forward to seeing you again in 2019! Le village de Pérignac est à 1 km à l'est. Il propose un excellent restaurant (La Gourmandière), des pizzas à emporter, une boutique, une pharmacie, un salon de coiffure, un bureau de tabac et une boulangerie pour le pain frais quotidien, tout proche à pied/en vélo. Le dimanche matin, un stand vend des huîtres sur la place devant l'église du village, et le mardi, il y a un marché au poisson au même endroit. De nombreux sentiers de marche et de VTT. Informations sur la location de vélos. Plus loin, prenez le ferry de Royan, et toute la région du Médoc s'ouvrira devant vos yeux. Au sud et à l'est de Bordeaux se trouvent les belles régions de Sauternes, Pomerol et St Emilion. Maison Maitre propose une expérience unique, et la Charente Maritime, la deuxième région la plus ensoleillée de France, avec la belle côte préservée, les huîtres de producteurs locaux, les vignes légèrement vallonnées, le cognac, le Pineau et les vins de Bordeaux à déguster, et avec son emplacement proche de l'autoroute et des correspondances aux aéroports, chacun pourrait y trouver son bonheur. Booking Notes: To make a booking, check availability on the calendar and contact us through the booking form on our website. (see link below). A 25% deposit is required to confirm a booking and the balance payable 8 weeks prior to rental including a £300 security bond. Please note that our bookings are only full weeks, Saturday to Saturday in High season. Changeover Day: The rental period begins at 16.00 hours local French time on the first day of your rental and finishes no later than 10.00am local French time on the day of departure. The changeover day is Saturday.